Disappointing... had three pints, first two had to be changed because they were undrinkable, third just wasn't nice. Disinterested staff, couldn't cope with crowds. No food available - "ordering system couldn't cope"
Classic riverside pub on the Hammersmith Riverside. Now taken over by Hippo Inns -- we shall see how that goes as they have been good for pubs in other places, but nowhere so busy or well-frequented perhaps. Was back in the Blue Anchor after a couple of years on Thursday evening. The pub along with the neighbouring Rutland Arms has a fabulous location next to the River Thames. But it's central London prices and use of plastic glasses are a little annoying. It's practice of locking all the doors by 11:20 meaning you can't even use the toilets is also worrying. Thank God for the Rutland Arms! The ale selection was Sambrooks Pumphouse Pale & Lavender Hill & Nelson Blue Anchor Ale. No real cider is served. Although they have Orchard Pig Reveller on keg. A good place to meet and with a fabulous location. But nothing else to recommend it. Visited on a Saturday pub crawl of Ealing and Hammersmith areas, it is right on the river and was packed when we got there, had a pint stood outside watching the world go by, decent service seeing as how it was busy and the beer was well kept. 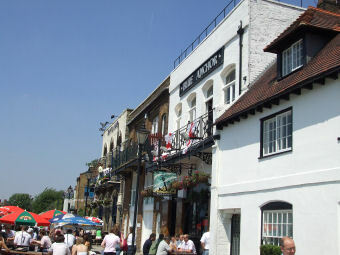 Thames side pub near Hammersmith Bridge. The outside seating area is on the pavement. There are parasols, but even so it can get a little hot there. We sat inside in the back room. This was very pleasant on a hot day to sit in the cool and shade. The pub is quite small, and fairly ordinary, though offers four casks ales from smaller, less well known breweries. We tried three, and all were in excellent condition. They have lots of wood, and some comfy leather sofas, and there's a pleasant laid back atmosphere. We enjoyed being there, though it's not a pub that I would especially urge people to visit, it served us well enough. We last visited this area a year ago, and drank and ate in the Youngs pub, the Old Ship. That is a larger, more professional place. There's more seating, and more choice of seating, there's greenery around, the terrace is shaded and off the pavement and slightly elevated so you get a better view of the river. But the prices are higher, and the beer choice is limited to Youngs.. At the end of the day, we couldn't say which pub we preferred - both have their charms. For lower prices and better choice of beer, here. For better and more comfortable views of the river, the Old Ship.